This topic is for discussing bugs and features of "EOL2". Note the quotes - the final name of the game isn't really written in stone yet. This first post includes the download links for the latest version. Before posting any bug reports or feature requests, check out EOL2 wiki page and the list of currently known bugs. Please consider posting bug reports and feature requests directly to GitLab. Copying them from this lauta thread requires extra work, especially because the syntaxes are different (BBCode vs. Markdown). You need to create a GitLab account, but you only have to do it once. IRC channel: #discord-developers @ IRCnet. Inactive. For details, see this post. - Investigate if the current API is good enough or if something should be added/modified etc. - Project renamed to EOL2. - Bugfix: Sometimes closing the result window required two esc presses. - Pictures and textures are shown. - Pictures and textures can be animated (using multipage TIFF images). - Bugfix: Internal replays did not work in original Elma. - Bugfix: EOL2 would crash if there was an object with invalid animation number in the lev. - Added support for lgrzip format. - Added support for 32-bit graphics. - Added support for OS X. - Added better support for keyboard navigation in menus. - Added support for Emscripten (web browser) version. - Show rotation speed and its max value during ride. - Bugfix: Bike went off screen with big zoom and non-centered camera. - Bugfix: Non-centered camera did not get updated properly while playing a replay. - Added a simple keyboard shortcut mechanism for menus. - Added replay playing possibility after a ride ends. - Show information (currently speed, max speed, one wheel status, apples) during the ride. - Made numpad enter key alias for normal enter key. - Removed lag that occurred while loading externals. - Bugfix: Ground and sky textures were displayed upside down. - Bugfix: Mouse scrolling was not working in key config tab. - Added support for Linux (Ubuntu). - Minimap resizes according to window size. - Level size limits (dimensions, objects, vertices, polygons) have been lifted (only memory is the limit). - Replays can be saved. So far the rec format is the same as in original Elma. Playing is not yet done, so you have to use external player or Elma. - Arrow displays the direction of gravity in gravity apples. - Time is shown after ride (and whether it was finished or not). - Reset defaults -button for keys. - Toggle show/hide button for multiplayer mode (hides/shows the player's view). - Improved level loading speed a LOT. - Fixed flower in front of kuski. - Fixed a possible very slight lag while playing. - Non-centered camera works now. - Added brake and escape alias keys. - Keys tab page layout is a bit better now. - Local multiplayer mode works now. - Fixed crash when lev folder was empty. - Level loading stopped when encountering invalid lev. Not anymore. - The order of windows is now remembered. Sometimes after finishing a ride, a wrong window was activated. Not anymore. - Inactive windows become transparent. Last edited by Smibu on 16 Dec 2018, 15:10, edited 37 times in total. sure if works on XP? not working for me. Yes, it should work on windows xp. And what comes to low fps, it may be scanning the level folder at the background, which causes a lot of fps lag. I guess we will provide a 'better' way to deal with the level loading so all the levels are loaded without the lag. Ropelli wrote: Yes, it should work on windows xp. And what comes to low fps, it may be scanning the level folder at the background, which causes a lot of fps lag. I guess we will provide a 'better' way to deal with the level loading so all the levels are loaded without the lag. Lammas: Check if your lev folder is not empty, it might be the case. edit: Scratch that. Works now. No problems other than the ones listed. Lousku: Snajdig, forgive all my subtle and not so subtle hostility towards you in the past. I can't go on harassing anyone who produces sach sweet wisdom. ground jittering is probably the most annoying problem atm. Also noticed some difference to original with hand animations and rear wheel / suspension looks weird also, i cant quite say why exactly. Unwork for me as well, some grey screen comes after the black one and just "stopped working" error message. It should work if it's just installed right, but we will make less error-prone in the future. Anyway, possible errors may be missing state.dat, missing datafiles folder & files, empty rec or lev folder, no default.lgr file, and possibly few others I dont remember right now. separate window if esc/die/finish. And add brake alias key. Wow so much progress already. Hands and terrain are an eyesore, but aside from that, feels like good old elma, good job. Hand movements make it harder to feel it the right way though, as sometimes it looks like backwheel is stretched further back than it should, but i guess that's only a false impression induced by hands' magix. anpdad wrote: Wow so much progress already. Hands and terrain are an eyesore, but aside from that, feels like good old elma, good job. Hand movements make it harder to feel it the right way though, as sometimes it looks like backwheel is stretched further back than it should, but i guess that's only a false impression induced by hands' magix. Improved level loading speed a LOT. Fixed flower in front of kuski. Fixed a possible very slight lag while playing (at least I had something like this in my own comp, but not anymore after this fix). Added brake and escape alias keys. Keys tab page layout is a bit better now. Local multiplayer mode works now. Fixed crash when lev folder was empty. Level loading stopped when encountering invalid lev. Not anymore. The order of windows is now remembered. Sometimes after finishing a ride, a wrong window was activated. Not anymore. To update, just overwrite all previous files. NOTE: If you have modified the graphics files (in datafiles folder) somehow, be sure to backup them. NOTE 2: When the levs are loaded for the first time, it is probably slower than the subsequent loads (thanks to OS caching). Wiki page is out-of-date, but it will be updated soon. For those who are experiencing problems (Orcc, Labs, jonsykkel, Madness, Hosp, Lammas, anyone else? ), here is the debug version. The debug version outputs more messages in the console and is quite a lot slower than the normal version. So download this one only if the game is crashing for you. Paste the output messages in this topic so we can find out better what's wrong. (If it's very long output, go to http://pastebin.com and just give link here.) Note that this zip contains only the exe file, so you still need the datafiles folder from the elma2.zip file, if you don't have it already. tried on two diff comps (XP and Vista), works fine on both. Well done lads. Ropelli: I guess the debug libs are statically linked into the exe, just like CEGUI, Boost and others, so I think it should work... at least there were no strange DLL dependencies in the exe when I looked, just a few more imported functions from kernel32. Labs: That's not the debug version you're running. Try the elma2_d.exe in this zip. This way we get some more detailed error messages. Tried with basic lgr and with my own too but the same. The first version worked but when there came new on the 29th it didnt work, didn't have problems like Orcc with the first version. Smibu wrote: To update, just overwrite all previous files. I did that, but it wouldn't work until I deleted options.dat too. Maybe that's the problem with others: delete options.dat in addition to replacing the zipped files. And those error messages are a bit weird because I don't have "c:\omat\" folder. ok, problem solved. I forgot to copy the "datafiles" folder. To get it completely free and to get some new features to it. The high ascii characters change to varieties of A [ÁÅÃÀ plus one or two other characters] from what I found. Each time you reenter options and save, or just by changing to Player 2 menu and back to Player 1, the amount of characters double. This only happens in the Name field. Default options button (for each player separately preferably). I know you can just delete the options.dat file to restore all options to default but others might not. Warning/error message when using the same character for different buttons. At the moment only one gets triggered in-game, the other one is just ignored. Launch Elma 2 -> click Play -> [Internals tab] Click Index to change the sorting of the internals. Resizing column headers all the way to the left makes them disappear. Launch Elma 2 -> click Play -> Resize the column headers in Internal tab or External tab [Index, Filename, Title, Path] all the way to the left so it disappears. To make the headers reappear either relaunch Elma 2 or resize the Play window by clicking and dragging of the left or right edges. Launch Elma 2 -> Play any level and enable mini map. Elma 2 crashes when opening an external level with high ascii characters in filename. Add high ascii characters to the filename of an external level and launch that level in-game. 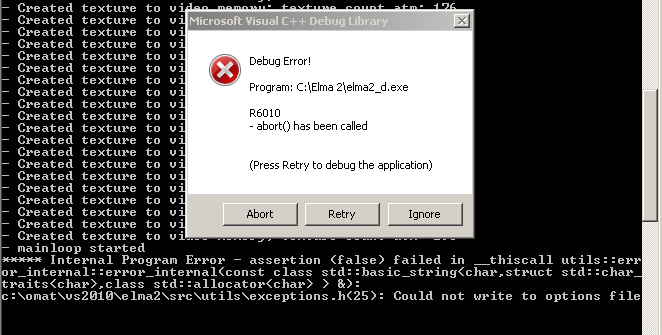 Cannot add any error messages because the debug window crashes as well. I couldn't find any log files. Edit: From the look of the debug console window it seems elma doesn't crash but actually just quits normally. It says something like "Deleted texture from ...."
Double-tapping right edge on a column header in Play window [Index, Filename, Title, Path] automatically resizes down to the smallest size that fits. At the moment if you double tap the column header it will first sort the list in ascending or descending order and select the top level, and then on your second click it will launch this level. Options -> Play mode -> Single radio button disappears when activating it by pressing the black space between Single and Multi. This only happens for the Single radio button. The activation area of the Single button is all the way to the next button compared to the Multi and Flagtag's. It is possible to scroll in the other areas if you spin the wheel very much/fast. But I found this to be very inconsistent. Scrolling works perfectly in the Play window. Creating a new reply since this is not really bug related but just a question. What is the string box than appears when typing in the Play window for? I assume it is for searching and it is not working in this beta version but when you press enter it just loads the selected level. Will it be instant search like Google Instant (first example I could think of? This pixel rendered me in a state of profound depression. It gotta be fixed in the first place! Thanks Xiph for all those bug reports :) I was actually aware of bugs 2, 4, 6 and 7 but not others. I added all of them to the wiki now. Xiphias wrote: What is the string box than appears when typing in the Play window for? I assume it is for searching and it is not working in this beta version but when you press enter it just loads the selected level. Ye, it's a search box and it should work already in Externals tab. In Internals tab it doesn't really work nicely atm (it only finds qwquuXXX names). In Externals tab it searches by filename, just like in EOL level list. Feature requests sound good too. Ye, it's a search box and it should work already in Externals tab. In Internals tab it doesn't really work nicely atm (it only finds qwquuXXX names). In Externals tab it searches by filename, just like in EOL level list..
Also if you set escape alias as 'M', for example, every time you use it that search pops up with 'M' in it. Not a problem if you're going to play the same level again, but if you are going to do a search after hitting escape alias you have to push backspace to remove that unwanted character. Cursor is visible in-game when in full screen. Flower is visible in Flag Tag mode. I think this is not in Elma. Player doesn't re-spawn when dying to a killer in Flag Tag mode. If both players die the game ends. Edit: Apparently this is also in Elma, so not a new bug. But maybe it could be fixed in Elma 2? This one I noticed yesterday but couldn't reproduce it after a while. Now it appeared again but only until I closed elma again. The screen flickers when moving the mouse around whilst in Player Options. I will try to remember what I'm doing the next time this happens. I have only noticed this in Player Options. 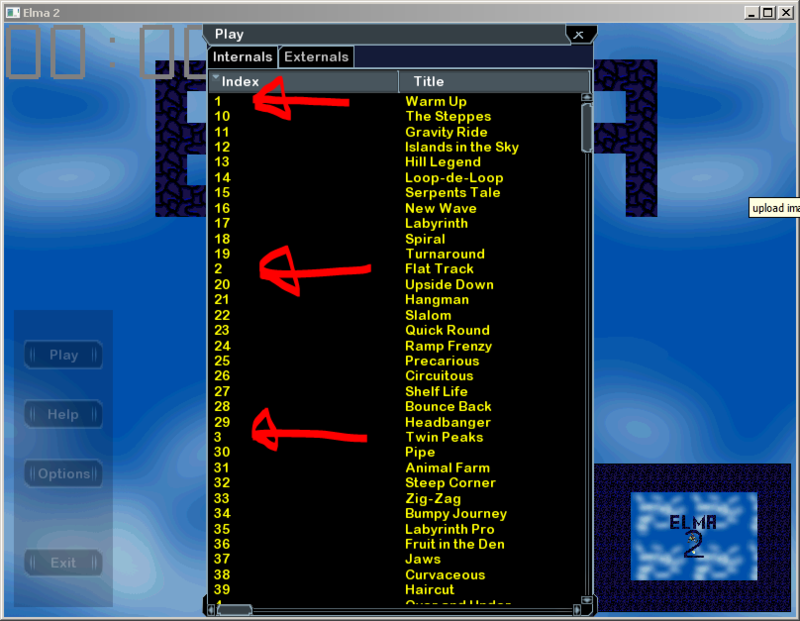 Strings in player options move a character to the left when scrolling. Happens only the first time. 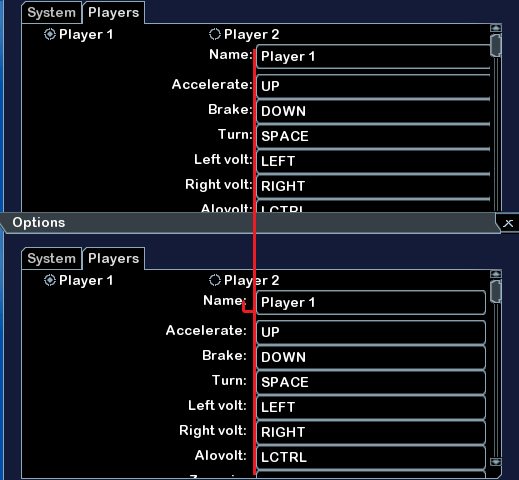 Launch Elma 2 -> Options -> Players -> Move the scroll bar or turn your mouse wheel. 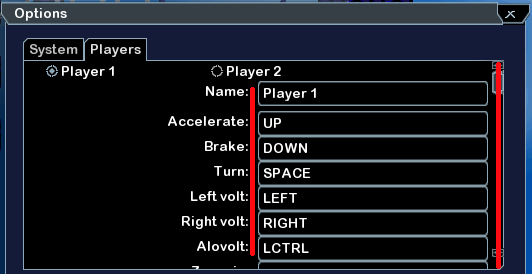 Notice the strings Name, Accelerate, Brake, etc.. move a character to the left. See screenshot below. Bug 6: - Not sure if this is a bug. Seems that there is an exception written for this already. Elma 2 crashes if you try to save options when the Options.dat file is set to be Read-only and/or Hidden. it's time to setup a bug tracker ! I find that the default key for zoom in '+' doesn't work. Instead I have to change it to '='. 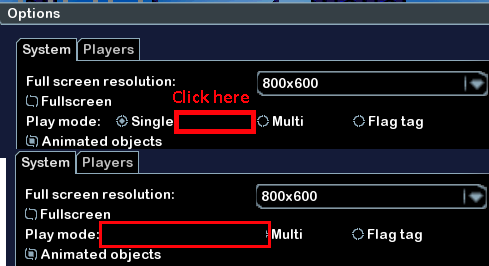 Whenever I click save options my zoom always resets. I'm having a hard time reproducing it but it got to a point when ever I clicked save options my zoom would reset to a great distance, so that the level was only a few pixels wide. Would be great if the zoom didn't change at all after saving options. Added bugs 1, 2, 3 and 5 to wiki. Didn't add 4 because I wasn't able to reprocude it either. And yeah, 6 is not really a bug either. We throw an internal error whenever we can't "handle" an exception, such as all LGRs missing etc. I just used a decompiler + a script to make the code compilable + some manual fixes. Lee: yeah we'll try to fix the accidental search box popping up. Added this as a bug in the wiki too. And about the zoom key not working - strange, haven't been able to reproduce it yet. totem wrote: it's time to setup a bug tracker ! Yeah, a bug tracker would be good most likely - more suitable than a wiki. Edit: it has been set up now! Last edited by Smibu on 17 Mar 2013, 11:04, edited 1 time in total. There is actually a bug with the zoom. When you hold down the zoom button the zoom goes at first slow then faster then super fast (all in a second) and then zooms in/out at a constant speed. It is most visible when zooming out. It is as if the zoom pops after about 0.5-0.6 seconds and then it flows smoothly. Is it on purpose that the terminology has been changed in the options menu? Elma uses words like Throttle, Change direction, Rotate etc. I know these are not words we use but I was just wondering. Option for that Splitscreen/Full view missing (when playing multi and you press 1 or 2). 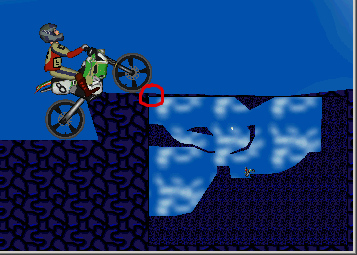 As I mentioned earlier on IRC, it sometimes crashes when I try to enter a level. The strangest thing about it is the irregularity - today it crashes roughly every second try, yesterday not once out of 50 tries. Added bugs 1, 2, 3 and 5 to wiki. Didn't add 4 because I wasn't able to reprocude it either. Okay I figured out how to reproduce this one. 1. Delete Options.dat to keep Elma 2 fresher. 2. Launch Elma -> Resize the main window to any size. An inch wider/higher doesn't matter. 3. Options -> Change tab to Players -> Hover the mouse between the tabs System and Players or from inside the Players menu and out of the Options window. If you quit and relaunch Elma 2 the flickering disappears but if you resize the main window again and repeat step 3 the flickering reappears.